Eric West is your expert guide to the world of cider and perry. 1) Complete medal results are released for this year’s Great Lakes International Cider and Perry Competition. 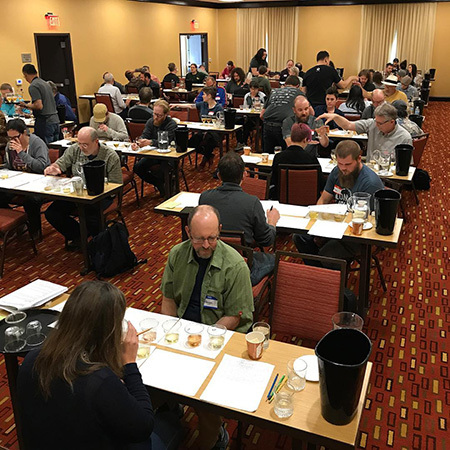 For commentary, see Cider Sets Records at 2018 GLINTCAP by Darlene Hayes for Cidercraft, Let’s Talk GLINTCAP from 2 Towns Ciderhouse, and a personal recap from Tristan Wright of Northern Virginia’s Lost Boy Cider. 2) Cider Culture recommends 6 Garden-Fresh Ciders to Try. And Cidercraft explores The Mysterious Craft of Keeving. 3) Here Are the Top 10 US Cities for Drinking Cider according to Redfin. 4) WGBH explores the metro Boston cider scene in The Great Cider Adventure Takes Us Every Which Way But East. 5) Hard Cider News interviews Robert Brosofsky of Shoal Hope Ciderworks on Cape Cod, lists Five Ciders For National Strawberry Month, and visits with Cottonwood Cider House in North Dakota. 6) Notable profiles: Embark Craft Ciderworks (Williamson NY), Cider Creek Hard Cider (Hammondsport NY), Pierced Ciderworks (Fort Pierce FL), and Redfield Cider Bar and Bottle Shop (Oakland CA). 7) Cider Chat shares dinner with Carlo Hein of Luxembourg’s Ramborn Cider Co.
8) The Irish Post lists 14 of the best Irish ciders to enjoy in the sunshine. 9) Nagano Cider Collection is Saturday in Iida. The Cambridge Beer Festival closes on Saturday. The Welsh Perry & Cider Festival and Clytha Fest 2018 run through Monday evening. And the British Cider Championships at the Royal Bath & West Show opens on Wednesday. 10) Along Came a Cider reviews Tieton Sparkling Perry and Stem Ciders Perry. CiderScene helps you Get to Know the US Association of Cider Makers. Cider Couple reviews Downeast Original Blend. Cider Revival reviews Embark Farmhouse Raspberry. Cider Table reviews Wyndridge Black Cherry. The Cider Drinker reviews Brännland Iscider Fatlagrad Barrique 2014 and Friels Raspberry, Lime & Mint. Cider Explorer answers Where to drink/buy cider in Wrocław? and reviews Goldkehlchen Weichsel, Floribunda Apfel-Cider, and Hogan’s Dry. And Real Cider Reviews wraps up the 2018 Batlow Cider Festival.